Is It Good? 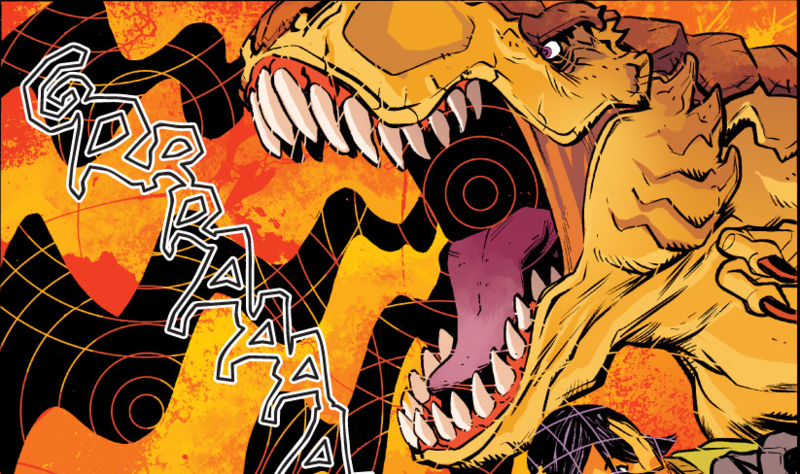 Terrible Lizard #1 Review – AiPT! From what I’ve read of Cullen Bunn’s work, I think he’s a good writer. I really enjoyed Fearless Defenders when it was around (weak conclusion, but an all-around fun comic) and Sinestro is the best Green Lantern book currently put out by DC in my opinion. So here’s Terrible Lizard—a creator-owned book by Bunn. I’m curious to see what his work is like when he’s free to cut loose. Is it good? Now if you looked at that cover, it’s already very apparent what type of story this will be. Yes indeed, this is the touching story a young girl and her pet T-Rex… and they’ll eventually team up to fight monsters. However, we are getting ahead of ourselves here. This is your basic first issue for a new series, focusing on setting everything up: Terrible Lizard #1 introduces the main character, the basic premise (not much monster or lizard aspects yet, mind you), some of the supporting cast, and all of that other good stuff. The setup is done at a quick, engaging pace, so I’ll give it that. The other thing about Terrible Lizard is that it is a comic for all ages and it does a relatively good job of sticking to that. It has a familiar premise for a kid’s story (in the sense that it’s about a kid and her pet), but completely flips it upside down with the inclusion of a dinosaur (and besides the Transformers movies, dinosaurs make everything better) and the eventual monster fighting. That’s rather exciting and surely should be attention grabbing for kids. Terrible Lizards #1 also is not overly violent, the protagonist is relatable (if a bit standard), and the book seems to be having fun playing around with a lot of the common tropes seen in this sort of tale. It’s got potential to be a fun comic for kids and adults alike. Egregious amounts of tubing is the key to success for any scientific experiment. With regards to Bunn’s writing, it’s well done overall. The dialogue and narration are fine, although the characterization is a bit typical for these kinds of characters (like Jessica and her dad), with the exception of Colonel Grayson. This is where Bunn seems to be playing around with the tropes, making Grayson a real over the top and gung-ho military agent to the point of parody. Grayson definitely has some of the best lines in the comic. The pacing is decent, the story flows just fine, and the storytelling works. Humor-wise though, this issue was a bit forgettable. Hopefully, the humor, along with the characterization and action, improves going forward. The artwork by Drew Moss definitely excels in some areas. His designs for the monsters and creatures (that we briefly see) look impressive and the action and sci-fi aspects of the book are very striking. Sadly, we don’t get to see much of them this time around, but hopefully the next issue will change that. Otherwise, Moss’ work is just fine during the more down and quiet moments. The layouts are fine, the characters look alright (though there are moments where the characters are severely underreacting), and the coloring is decent. All in all, the artwork gets the job done well enough. Your dad is Jim Gordon with a science degree? Terrible Lizard #1 is a good enough start to this kid-friendly series. It’s a bit run-of-the-mill with regards to plot and characters thus far, but also really turns some ideas and tropes around on their heads and has fun doing it. It’s not quite a must read yet, but something tells me that when it finally takes off, it will be.